I love to jump in waves that roll in off a sea, an endless amusement. I love to get tossed about, sometimes with just a touch of danger, getting a bit battered, bruised, but always standing up laughing (after adjusting the bikini to make sure no one gets an unexpected peep show). I love to catch a wave just so and body surf into the shore. When I find good waves⏤not too tame, not too raucous⏤I can stay out there until I'm a prune-y, salty mess. Unlike those happy, carefree waves, he came thundering down on my soul, unceasingly. But you see, I have practice and experience with waves, and I can ride them. So while I may have gotten caught in the undertow for a while, I'm back up on my feet, bikini sorted, a few bruises, but far from broken. Would you like to receive my daily mosaic hot off the press in your email inbox each day? Sign up here! I started making a mosaic a day as a way to increase my artistic skill set and make mosaic art more accessible. 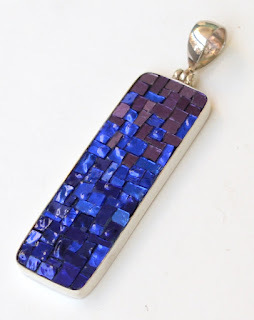 Now the blog has become a platform showcasing my mosaic jewelry and nomadic life. If you would like to purchase one of my mosaics, simply email me with your address for purchase price and shipping costs. Prices start at $100USD. Payment is by Paypal. Shipping is calculated on a case by case basis based on where I am at the time and your location. Check back for future workshops!